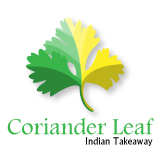 Coriander Leaf Indian Takeaway, Chichester, West Sussex – Hello world! Estimated delivery times are upto 60 minutes on weekdays and 90 minutes on weekends. Collection is 30 minutes weekdays and 45 minutes on weekends. For specific times, please call us. Minimum order value £12 for Free Delivery within 5 miles radius. Open 6 days a week 4pm to 11pm (including Bank Holidays).